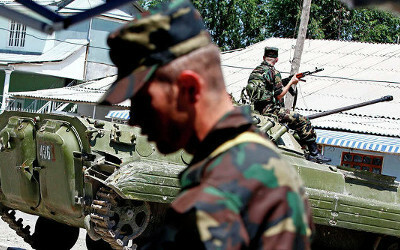 AKIPRESS.COM - Russian media announced that Moscow would provide financial assistance and weapons to Turkmenistan forces. Turkmenistan has remained neutral, but authorities grow increasingly worried over the growing instability in neighboring Afghanistan. President Gurbanguly Berdymukhamedov stated that he intends to upgrade the military and improve soldier training, according to Economy Watch. Turkmenistan’s outreach to Russia is a surprising move when considering the country’s staunch resistance to foreign military aid of any kind. Turkmenistan shares a tumultuous history with Russia that remains fresh on the minds of many Turkmens. Ashgabat is an isolationist in its geopolitical stance, but has sent mixed signals to the world regarding its independence. In the past, officials asked the U.S. for border assistance in order to combat the Taliban, but later refused American help. Further, Russia offered border security for Turkmenistan in early 2016, but Turkmen leaders refused the offer. The U.S. has pledged to help Turkmenistan with its border, but human rights abuses and lacking reforms remain obstacles to improved diplomatic relations. The U.S. has also vowed to work with Turkmenistan in areas of private sector investment, and Washington has called for significant economic remedies in the form of market liberalization. Russia holds interests in Turkmenistan as well, but is less concerned about the internal structure of the economy. Russia’s interest in Turkmenistan is rooted in natural gas deals, including the country’s substantial oil and natural gas reserves. Turkmenistan has the fourth-largest natural gas deposits in the world. Many foreign companies are eager to establish operations, but the government has yet to instill a friendly business climate that welcomes investors, notes the U.S. Department of State. The energy sector is plagued with corruption, and the government’s ineffective management has hurt other vital sectors such as agriculture. Overall, the economy remains barren and destitute, especially as lower energy prices dampen economic prospects. An increasingly destabilized Afghanistan also poses a threat to economic security and a stable business climate. However, militants pose little threat to Turkmenistan’s secular authoritarianism that buffers extremist incursions, and officials retain an advanced security apparatus that renders a takeover virtually impossible. Nevertheless, militants have gained footholds in some areas, and the Turkmen government finds itself overwhelmed as it shares borders with a nation on the brink of ruin. Turkmenistan is left with few options, but Ashgabat risks isolating the U.S. and other Western powers by building a stronger military alliance with Russia. Turkmenistan’s pivot to Russia is a reluctant one, and it will be harder to retain neutral status in a divided geopolitical landscape that inevitably forces small nations to choose a side.